It is now a fitting occasion to remember Debiprasad Chattopa-dhyaya and his works. 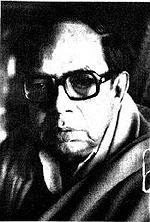 Debiprasad Chattopadhyaya was born in Kolkata on 19 November, 1918. He had his early schooling in the Mitra Institution, Bhowanipur, Kolkata and studied philosophy in the Presidency College, Kolkata and Calcutta University, standing first in the first class both in BA (Honours) and MA in 1939 and 1942 respectively. It is ironical that he took Indian Philosophy (Vedanta Group) as his Special Paper in MA, since throughout his later life he waged relentless battle against Vedanta and other forms of immaterialist philosophy. An indefatigable worker and prolific writer, Chattopadhyaya has more than fifty volumes (some of which are quite bulky) and a considerable number of edited works to his credit. Long before he shot into fame for his philosophical works both in Bangla and English, he was already recognised as a promising litterateur in Bengal, distinct from all others for his extremely down-to-earth style and lucid way of exposition. He was active in the Progressive Writers’ Association (later renamed Anti-Fascist Writers’ Association) in the early 1940s, working with Bishnu Dey, an eminent poet of Bengal. The warm relations between the two can be seen from the letters written by Dey to his protégé over the decades. In the late 1940s and early ‘50s Chattopadhyaya was better known as an author of children’s literature in Bengal, writing stories, novels, popular science titles and biographies for school-goers. He also collaborated with his elder brother, Kamakshiprasad in editing and running Rangmashal, a journal for children and Sanket, a short-lived but promising literary periodical. He edited a series of small books for adolescent Bengali readers, touching on various topics such as Janbar Katha (Book of Knowledge), Amrao Hote Pari (We too can become), Vijnan Vichitra (Various sciences) and the like. His own Bangla booklets on Anthropology, Biology, Psychology, etc. are marvels of popular-science writing. Along with Subhash Mukhopadhyaya he too should be credited with giving Bangla prose a rare élan. Earlier still, in his undergraduate days he was a budding poet, associated with an avant-garde group which sounded a new note in Bengali poetry after Tagore. Kayekti Nayak (A Few Heroes), a slim book of verse (never reprinted in his life time since its first publication in 1942) remains the only testimony to his youthful ventures. He also edited ‘Modern Bengali Poems’ (1945) in English translation (Martin Kirkman, a British soldier then stationed in Calcutta, bore the burden of translating most of the poems). This anthology is long out of print but deserves to be resurrected as an interesting document. Second-hand copies are still sold in the US at fancy price, as a search in the net will reveal. He also edited a selection of Manik Bandyopadhyaya’s short stories in English, Primeval and Other Stories (1958). Samar Sen, the poet and later founder-editor of Frontier, introduced him to the Manifesto of the Communist Party by Marx and Engels sometime in the early 1940s. Chattopa-dhyaya’s life-long friendship with Samar Sen, based on mutual love and respect, is proverbial; it is evinced in the letters written by Sen to the Chattopadhyaya brothers (published in two Bangla journals, Anushtup and more recently in Ebong Ei Samay). Association with Bankim Mukho-padhyaya, the labour leader and Radharaman Mitra of Meerut Conspiracy Case fame, extended his acquaintance with the theory and practice of Marxism. After a brief stint in the Labour Party with Ramakrishna Maitra and Subhash Mukhopa-dhyaya, he finally joined the Communist Party of India in 1944. It was Bhowani(sankar) Sen (Gupta), the CPI leader, who in 1951 urged him to apply Marxism to the study of ancient Indian philosophy. This suggestion actually changed the whole orientation of his life. From then on he devoted himself single-mindedly to the exploration of the rational and materialist currents in Indian philosophical and scientific heritage and stuck to this task to the end. Bhowani Sen had rendered another seminal service. Chattopa-dhyaya has been oscillating between Marx and Freud throughout the 1940s. By stringently criticizing Chattopadhyaya’s Bangla book on sexology in 1949 Bhowani Sen exorcised the ghost of Freud in him and set him firmly to the Marxist path for the rest of his life. His Bangla books written in the early 1950s bear the mark of his final and total conversion and unswerving commitment to Marxism. The primer, Marxvad (1952), is still considered best suited for the uninitiated to the study of dialectical materialism. The first product of Chattopa-dhyaya’s investigations into Indian philosophy is Lokayata, published first in Bangla (1956) and then entirely rewritten in English (1959). Both have been reprinted several times and have been translated into a number of Indian and foreign languages, including Russian, Chinese and Japanese. To date this remains his best-known work. As the reviews in leading journals and personal letters from savants all over the world show, the work supplied a long-felt need and opened a new vista in the study of materialism in India. It will be no exaggeration to say that Lokayata has taught and will continue to teach generations of scholars both at home and abroad how to view philosophy in a new light. Chattopadhyaya eschewed all existing models of enquiry and searched for the roots of materialism in anthropology, took a radical view of both Samkhya and Tantra, and studied the evidence of the Vedas in a way never attempted before. A small ‘Popular Introduction’ to Indian Philosophy came next. Published in 1964, the work provides a bird’s-eye view of the major schools. Planned as a direct antithesis to Sayana-Madhava’s fourteenth-century compendium, the Sarva-darsana-samgraha, which started from the Lokayata and stopped at Vedanta, Chattopadhyaya’s book moves in a more orderly manner, following the developments of different schools in terms of their historical origin. In ‘Indian Atheism’ (1969), Chattopadhyaya discussed even the astika (pro-Vedic) schools of philosophy and brought out the atheistic contents inhering in them. The Ur-Samkhya and Ur-Nyaya, he demonstrated, were definitely atheistic as was Mimamsa itself. This is a more erudite work than the preceding one, more closely argued and profusely documented. ‘What is Living and What is Dead in Indian Philosophy’ (1976) explores new grounds, covering a wider area. Chattopadhyaya’s level-headed analysis helped resurrect a number of positive elements in both early Buddhism and Nyaya. A work of stupendous scholarship and meticulous research, the book is a sequel to Lokayata (at first it was tentatively named Further Studies in Indian Materialism) and remains a classic of its kind. Chattopadhyaya was already making forays into new territories as was evident in his Science and Society in Ancient India (1977). In a sense it is a continuation of his previous work where his endeavour was to excavate the scientific kernel out of the theological mumbo-jumbo that marred the two basic works of Indian medicine and surgery, the Caraka-samhita and the Susruta-samhita. Surendra-nath Dasgupta, his teacher, had earlier said something about the ‘philosophical speculations’ of the medical schools in ancient India but Chattopadhyaya went much further. He showed the forces of ‘counter-ideology’, the canonical Hindu law-makers, in league with the powers that be, had compelled the scientists to pay ransom to the state-approved orthodoxy, forcing them to include much that is extrinsic and detrimental to science. This is why, he argued, medicine and surgery in India could not develop into a more exact science after a brilliant beginning. Chattopadhyaya exhibited his true acumen as a historian of ideas in this work. He was the first to point out how tangled up the basic Sanskrit texts of medicine and surgery are, containing both science and its opposite. He accounted for this odd mixture by pointing out the authoritarian intervention of hide-bound religion. The opposition to medical science, he pointed out, is most prominent in the so-called sacred books of India, particularly the Yajurveda and later Smriti (law book) works like the Manu-samhita. Later he wrote a booklet in Bangla (Prachin Bharate Chikitsavijnan, 1992) providing a synoptic view of all this. ‘Science and Society in Ancient India’ may very well be considered as the second turning point in Chattopadhyaya’s career after Lokayata. His focus of interest now shifted to the history and philosophy of science in ancient India. After retirement from his teaching post in City College, Kolkata, in 1978 (where for more than two decades he had taught rudiments of logic and philosophy to the undergraduates), he started afresh as a student, teaching himself different branches of ancient science. With the avid interest of an explorer, he now studied, besides medicine and surgery, astronomy and geometry. His magnum opus, History of Science and Technology in Ancient India in three volumes (1986, 1991, and 1996, the third volume was published posthumously) differs from all other works of its kind. Instead of taking off from the more convenient area of Vedic India, he concentrated on the Indus Valley civilization. This yielded excellent results, provide as it did the very important missing link in the field of astronomy vainly sought so far by Tilak and Jacobi. It also clinched the problem of dating the Vedanga Jyotisha. Relating the rise of science to the two periods of urbanization in ancient India, he created a new paradigm for the study of the history of science and technology in the East. He rescued the discipline from the conventional cataloguing of achievements without any reference to the socio-historical backdrop. At the same time the way he linked the technique of brick-making and the geometry of the Sulbasutra-s (the art of making sacrificial altars) also established the continuity of the Indus Valley tradition throughout the Vedic era and beyond. In spite of his preoccupation with history of science, Chattopadhyaya never lost touch with his first love, philosophy, particularly Marxist philosophy. He wrote Lenin the philosopher, first in English (1979) and then in Bangla (1980). His last work in this field was Bharate Vastuvad Prasange, a review of materialism in India, written in Bangla (1987, revised second edition 1991) and its self-translation, In Defence of Materialism in Ancient India (1989). Like some of his other works, this too has also been translated into Hindi. Chronic illness, lack of basic amenities, inordinate delay in publication–all this dogged his footsteps throughout his life. Yet over and above the works mentioned above, he brought out and edited a scholarly journal, Indian Studies : Past and Present (1959 -1973), translated with Mrinalkanti Gangopadhyaya (whom he fondly mentioned as “ my young friend and teacher”) the Nyayasutra and its commentary by Vatsyayana along with the annotations by M M Phanibhushana Tarkavagisa (two volumes,1967-1968; rest of the work was completed by Gangopadhyaya alone), edited the first ever complete English translation of Lama Taranatha’s Tibetan work, History of Buddhism in India (1970), History and Society (Nihar-ranjan Ray felicitation volume) (1978), a three-volume collection of essays entitled Studies in the History of Indian Philosophy (1978-1979), another two-volume anthology, ‘Studies in the History of Science in India’ (1980), and a collection of essays entitled ‘Marxism and Indology’ (1981). Carvaka/Lokayata : An Anthology of Source Materials and Some Recent Studies (1990), again in collaboration with Mrinalkanti Gangopa-dhyaya, filled a long-felt need. It has been reprinted several times and is a recommended reading for students in many universities , both home and abroad. Chattopadhyaya ably planned and edited an eight-volume populariser, Global Philosophy for Everyman (1990-1991), three of which written by himself. His last editorial work, ‘Studies in Indian Culture’, was planned on a grand scale but only the first volume (1992) could see the light of day. The range is breath-taking, so is the grip over such diverse material. Special mention must be made of two other works. The first is the masterly abridgement of the revised version of Rajani Palme Dutt’s India Today, renamed ‘India Today and Tomorrow’ (1955). Done in collaboration with Dilip Bose, the abridged edition was translated into German in 1958. The second is the re-issue of Romesh Chandra Datta’s Bangla translation of the Rigveda-samhita with additional material provided by other scholars and a synoptic view of the Vedic literature contributed by Chattopadhyaya (1963). It is a pity that both are long out of print. One reason why Chattopadhyaya could achieve so much in a relatively short span of life is that he could always form a team of collaborators, both young and old, around him and inspire them with a sense of commitment. Planning, writing, copy-editing, proofreading– everything went on smoothly and harmoniously with each member of the team feeling himself or herself a part of the work, and equally responsible for the outcome. Chattopadhyaya was never niggardly in acknowledging their service and faithfully mentioned their names in the prefaces of his works. Official honours came late in his life, and those too first from abroad. He was made a Member of the Academy of Sciences of the then German Democratic Republic in 1975 and awarded D. Sc. honoris causa by the Academy of Sciences of the then USSR in 1981. Several Indian institutions also granted him Fellowships and awards. However, he felt more gratified when he found young activists making use of his works in the ideological struggle against obscurantist forces. He edited a reader in Bangla called Pratirodh (Resistance) in 1991 on behalf of a monthly, Utsa Manush, which contained essays and excerpts from the writings of the illustrious men of letters of Bengal, from Rammohun Roy to Satyendranath Bose. The reader highlighted the age-old battle of reason against the forces of conservatism and orthodoxy. Besides, Marx, Engels and Lenin, V Gordon Childe, George Thomson and Joseph Needham exerted enormous influence on him. He was never reluctant to acknowledge his debts to them and always mentioned them with gratitude. He used J D Bernal’s ‘Science in History’ as a handbook. He had the highest regards for Walter Ruben, John Somerville and Burrows Dunham. With D D Kosambi, Trevor Ling and Dale Riepe he was in terms of warmest friendship. The personal archives of Chattopadhayaya contain records of his correspondence with litterateurs, philosophers, historians and friends from different countries. When published, they too will bring out another facade of his amiable character. Chattopadhayaya was associated with several Encyclopaedia projects, both in Bangla and English. He was always ready to assist young workers engaged in rationalist and people’s science movement, and went out of his way to guide promising scholars in all possible ways. A man of very strong likes and dislikes, he was, however, ever prepared to revise his views. The fashionable trends of so-called Western Marxism and the New Left never impressed him; in fact they left him cold. Similarly he was totally out of sympathy with postmodernist pyrotechnics. A born polemicist, he was never hesitant to call a spade a spade, however famous his opponent might be. Many of his early Bangla essays remain uncollected (the work of editing them has just begun) and a few English essays and studies, mostly unfinished, await publication. An unrepentant Marxist-Leninist to the end of his life, a firm believer in human progress, science and reason, Chattopadhyaya was overtaken by death on 8 May 1993. To say that the void created by his absence can never be filled up is a statement of fact, not a mere cliché.